8" African-American dancers antique plate - crown & rope with "PR"
I inherited this beautiful and unusual 8" plate from my mother-in-law many years ago. She lives in New York and I live in California. I think she found it in a antique store. She would find these interesting treasures at the many antique stores in the Appalachian Mountains. She passed it on to me as she knew that I appreciated antiques. It's kind of a lost art out here in California. So I've been trying to find out more about my plate because the subject matter is so different. There is a mark on the back with a crown on top and underneath is a pretzel shape of rope. 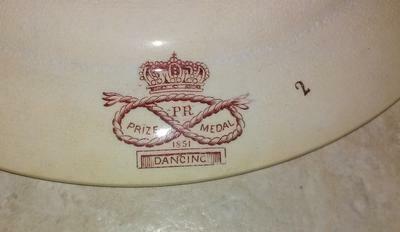 Directly under the crown are the letters "PR" and below that "PRIZE MEDAL" the date or # "1851" and a title "DANCING." There is a small #2 stamped next to it. 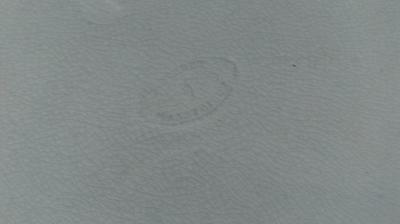 There is a non-colored stamp of a an oval and I can make out a #7 in the middle and the rest is too hard to read. Too many fine hairline cracks to read it, no matter how hard I try. On the front is a scene with two African-Americans dancing, two nicely dressed people sitting and watching, one playing an instrument and another behind him. There are two small dogs in the foreground. 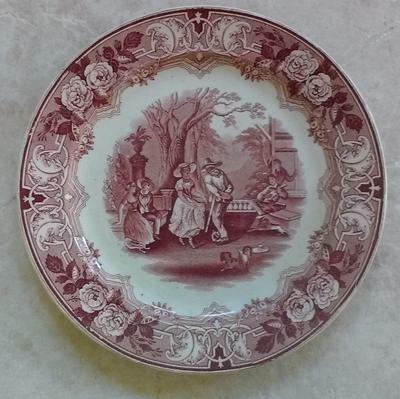 I would love to know more of the origins of this plate and where the scene is from. Comments for 8" African-American dancers antique plate - crown & rope with "PR"
I have the same plate in blue but it is a 10" dinner plate. I have not been able to ID it. Hi Martinez,I have just spent three hours plowing through my ref books,and on line and i have come to the conclusion that i had in mind before i started.That this piece is a Staffordshire item,the Staffordshire knot rope mark steers one to that,plus the Crown and the faint roundish impressed mark which is probably the factories full trade name.You could try immersing it in a bowl of bleach and paroxide for a day,it may clean out the crazing of grime and might show the mark better,i have even at times placed collectable but not too valuable item in the Dish Washer on its own with good outcome,either method would not effect the plate or glazing.You could spend the rest of your life researching it on and off and getting more and more fustrated.There were literally scores of small factories turning out table ware,your piece is part of a service called dancing,that maybe a tip to try and see if there is a dinner service on line for sale called by that name,it is worth a try.it is nicely tranfered and i would say late 19th Century.Value,who knows,i would just love it has an heirloom and pass it on.Sorry i could not be of futher help,i have an enigma of my own of 20 years which i spent months and months trying to tie it down to a factory but to no avail,but "WOW"! did i learn about pastes,glazes,Guilding,Enamels,while researching it,but that is a story you do not need to hear on your post. I have just a few days ago found this site and it is excellent for novice collector,dealer,and expert,because there are alot of experts working in the trade who are not!. "Great site and i will be posting on of my own headaches shortly to see if i can get assistance in Nailing a manufacturer.